Works of Wilde's annus mirabilis of 1891 in one volume, with an introduction by renowned British playwright. The Soul of Man Under Socialism draw on works from a single miraculous year in which Oscar Wilde published the larger part of his greatest works in prose -- the year he came into maturity as an artist. Before the end of 1891, he had written the first of his phenomenally successful plays and met the young man who would win his heart, beginning the love affair that would lead to imprisonment and public infamy. In a witty introduction, playwright, novelist and Wilde scholar Neil Bartlett explains what made this point in the writer's life central to his genius and why Wilde remains a provocative and radical figure to this day. Included here are the entirety of Wilde's foray into political philosophy, The Soul of Man Under Socialism; the complete essay collection Intentions; selections from The Portrait of Dorian Gray as well as its paradoxical and scandalous preface; and some of Wilde's greatest fictions for children. Each selection is accompanied by stimulating and enlightening annotations. 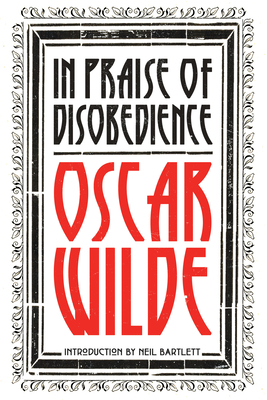 A delight for fans of Oscar Wilde, In Praise of Disobedience will revitalize an often misunderstood legacy. Oscar Fingall O'Flahertie Wills Wilde was born in Dublin in 1854. His novel, The Picture of Dorian Gray (1891), and social comedies Lady Windermere's Fan (1892), A Woman of No Importance (1893), An Ideal Husband (1895), and The Importance of Being Earnest (1895), established his reputation. In 1895, following his libel action against the Marquess of Queesberry, Wilde was sentenced to two years' imprisonment for homosexual conduct, as a result of which he wrote The Ballad of Reading Gaol (1898), and his confessional letter De Profundis (1905). On his release from prison in 1897 he lived in obscurity in Europe, and died in Paris in 1900.